Twitter is fast becoming the social media of choice for many travelers, and it is one of the first places travelers turn to for information, recommendations and travel inspiration. 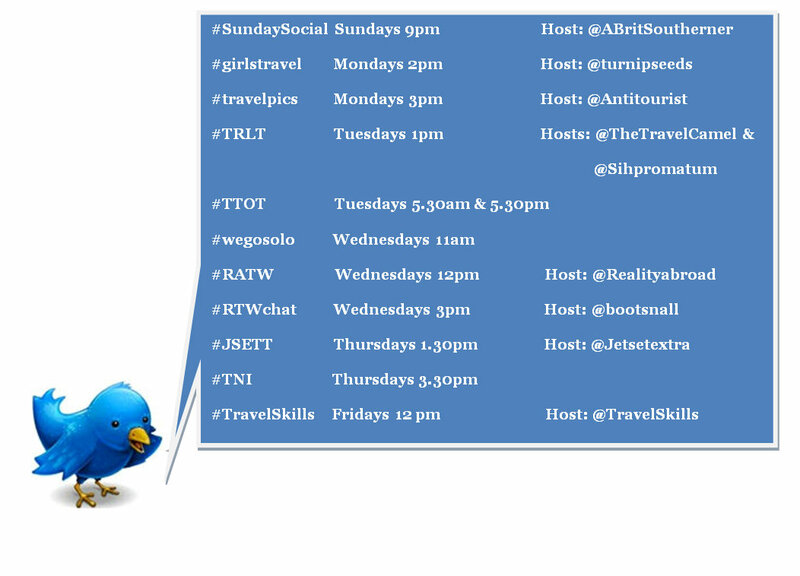 Below I have outlined the basics of twitter for those getting started, and listed popular accounts I believe all travelers should be following, as well as the times and dates for the most popular twitter chats! Hashtags: A hashtag is marked by the “#” symbol, and is placed in front of a word like #travel to allow people to search for a specific topic. Tagging your tweets with a hashtag will mean they turn up in searches for that topic. Trending Topics: On the right hand column of the twitter homepage you will see a section for “trends”. These are topics which are the most tweeted about at that time. Sometimes travelers get together on twitter for organized chats! They are great fun and an awesome way to network. The below is a list of my favorite travel chats. All of them are listed in EST (America/Canada) time unless otherwise stated. You can join a travel chat by searching for the hashtag at the correct time. Read the questions which are tweeted by the host (contact person listed below), respond, comment, interact and network! Remember to always include the hashtag at the end of your tweets so they show up for everyone else following the chat. I have found the best way to participate in fast moving chats is to have three internet windows open. My first window is the search results for my #, the second is open to my interactions (@connect), and third is open on the host’s twitter account so I don’t miss any questions. Know of any other travel chats on twitter? Let us know! When I first started out on twitter I identified the biggest travel blogs and followed who they were following. Over time I have come to know the below as some of the top people within the travel industry, who have the best tweets about travel. I would recommend starting here! Know of any other amazing travelers to be following on twitter? Let us know! @Airfarewatchdog: Tweets about unpublished airfare deals as well as interesting and helpful consumer travel tips. @ChrisGuillebeau: The expert on frequent flier advice, Chris also tweets travel inspiration. @travelfish: Follow Stuart for tweets on travel in Southeast Asia. @everywheretrip: Gary Arndt runs the biggest personal travel blog on the internet – he has been traveling around the world for years now, and has a wealth of information and phenomenal travel photography. @GlobeTrotScott: Scott is an Associated Press An airline reporter who also reports for the New Yorker. He is a self-proclaimed travel junkie who is always looking for adventures whether they be down the block or around the globe. @goseewrite: Michael is an ex-lawyer who is now permanently traveling. He tweets about his observations around the world as well as a lot of great current travel articles. @gottakeepmovin: Emma is an amazing writer, and tweets about traveling with purpose. @greenglobaltrvl: Bret and Mary are saving the world one tweet/story at a time! Your experts for eco and responsible travel. @Heather_Poole: Heather is a flight attendant for a major U.S. carrier, author of the New York Times bestseller Cruising Attitude and is fascinating to follow. Follow her if you’re interested to see what it’s like to be a flight attendant and juggle a family at the same time. @Hharteveldt: Tweets about what’s going on in the travel industry. @HuffPostTravel: Through hundreds of contributors the Huffington Post are continually creating and tweeting new content to inform and inspire travelers wishing to explore our amazing world. @JohnnyJet: Johnny does an amazing job at sharing relevant information on Twitter. He is a money saving travel expert who visits 20+ countries per year, and also the host of Travel Channel’s Hot Spots 2012. I visited his blog for a lot of these twitter recommendations! @kimmance: Kim Mance founded the Travel Blog Exchange and the TBEX conference. She specializes in female travel. @mappingmegan: – throwing myself into the mix because I believe I tweet a great mix of interesting news, travel inspiration and relevant travel information – you be the judge! @nomadicmatt: Nomad, vagabond, and author of “How to Travel the World on $50 a Day”. Showing people travel can be inexpensive in hopes of inspiring them to explore their world. Another resource I used to compile this list of top travelers on twitter. @NYCAviation: Tweets about aviation news, history and flight delays. These guys are generally always first to break travel news. @nycjim: Jim Roberts is the assistant managing editor of The New York Times. Though he doesn’t just tweet about travel, I find his links to news stories fascinating and timely. If you want to be in the know about anything (but many times his tweets are travel related) follow Jim. @ourfavadventure: Kathleen and Brock run an adventure travel blog, and have some of the most inspiring travel tweets currently on twitter. @pointsandtravel – A value luxury travel writer that tweets about the latest miles, points and deals for airlines and hotels, as well as international destinations that create extraordinary experiences. @Sean_Oneill: Travel tech Journalist for @BBC_Travel and a reporter for @Tnooz. @suitcases2: Michael and Nicole are an Aussie Nomadic couple living their dream of seeing the world indefinitely and sharing stories, tips and photos as they go. @theplanetd: Dave and Deb are an award winning Adventure couple who have been travel blogging and photographing their way around the world at ThePlanetD. One of the largest blogs on the internet, they are always sharing relevant travel information. @truenomads: Justin has been on the road for 3 years now and always tweets relevant travel information, his signature tweets being based around the “top 10” things to do in a different city each day. @turtlestravel: Providing travel inspiration and advice, and sharing stories from the road. Tweets are by Donny and Tamara, professional and leisure nomads, doing their best to be good citizens of the Earth! @USATodayTravel: Tweets are always on top of the latest travel news, deals and trends about flights, hotels, cruises and destinations, although they don’t tend to tweet any content other than their own. @vagabondish: Tweets inspiring articles, photos, and weird travel news from around the world. @WheresAndrew: National Geographic’s Digital Nomad, Andrew Evans is always traveling and tweeting. Great tips! Thanks for sharing them. I just stumbled upon #SBTC today, but maybe a little late! Looking forward to next week. Thanks Bee! Glad to be of help! Thanks Rohit! Twitter chats have also helped me meet like-minded travelers, really love them! Looking forward to chatting with you this Sunday! Glad we could help! Happy new years; hope it brings safe travels and a lot of blogging success for you!! What a pity with such a major time difference i can’t participate. A side effect of living on the tip of Africa! Thank you so much for this. If you were with me in person I could hug you. I’m trying to start my blog and I never get anything. I didn’t know what the Hashtags were. I didn’t know that you could search for topics. Other Bloggeres kept on talking about joining conversations on Twitter – and I’m just thinking how? It’s like a conveyor belt, how do you find anything or stay with it. Great list – followed the folks that I wasn’t already following. A lot of them are very ‘high-level’ looks at travel – rather different from my own style of tweeting and sharing specific places or things happening in my neck of the woods. Glad you found it useful! Nothing wrong with tweeting about travel in your own neighbourhood – I need to actually do more of that and focus a bit more on the distant memory of home!! Cheers to my Twitter guru! Will have to try one of those Twitter chats now that I feel like I at least have a clue. Great list, was looking for all the twitter chats! Glad we could help out! Twitter chats are the best fun! Happy tweeting! Great list! I have one of my own, but I keep missing out on all these chats that seem to pop outta nowhere! Also, is it possible to join one of your chats? It will be my first one! Thanks Megan! Hey Kaitlin! So glad you found the resource useful – feel free to shoot me an email if you would like and I have a write up of twitter tips from when I got started to now. Email is meganjerrard@gmail.com – and you can absolutely join one of the above chats; I don’t run any of them anymore, I handed over the reigns of #SBTC when we moved to Australia as the timezone didn’t suit, though it still happens every Sunday at 12pm EST – you just have to join by typing in and following the #SBTC hashtag on twitter. We have a range of fab hosts who run it now and it’s a blast every single week :) Have fun! Hi Megan, this is a great resource from the chats to who to follow. I will be busy on Twitter this weekend. Also, I love the map on your home page!! I have been blogging as a journal for years but just recently got serious about blogging in hopes generating an income. Thanks for sharing!! This is a great resource on who to follow on Twitter for this newbie here. Love your website and blogs. When: 12 P.M. on every 3rd Friday of every month.